Saxifraga is a large genus of the Saxifragacae family. Used widely as ground cover plants, most species grow well in woodland settings, preferring a moist shaded position. Saxifraga are generally speaking ‘rock plants’ or alpines. Generally speaking these are a low growing clump forming perennial commonly called ‘Rockfoils’ as they grow amongst rocks in alpine areas. They are a plant that dislike very dry soils, and they do not like a hot sunny position in summer. They are better suited to part shade, especially good afternoon shade. Excellent for planting beneath the drip line of deciduous trees, and equally at home when grown in containers, either as specimen plants or when used to underplant taller shrubs. A cool moist position is the best situation. With over 400 in the species the genus presents a much varied range for the gardener and collector alike. 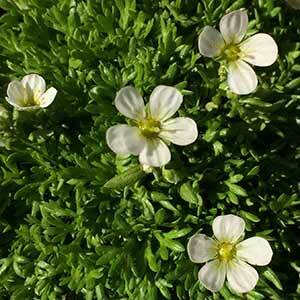 In fact these plants are so popular they have their own plant society The Saxifraga Society. Popular species and cultivars include. S. paniculata – Silvery foliage and requiring a cool climate to grow well, not widely offered. Saxifraga x urbium ‘London Pride’ is one worth looking for. S. poluangelica – Wonderful pink flowers over a mat of green foliage, excellent form. S. umbrosa – Easy to grow with tough foliage, a great plant for beginners although difficult to find. Saxifraga prefer a well drained position in sun to part shade. Many varieties are often grown in pots as ‘show plants’, once established they require little care.